New Delhi: India’s exports of iron ore to China have declined to almost nothing since August following a slump in demand for the commodity in that country, resulting in an almost 50% decline in the price of the mineral in the global market. China has, over the past few years, been the single largest consumer of iron ore, a key input in the manufacturing of steel, in the runup to the Beijing Olympics. “The construction boom in China seems to have come to a pause sometime during the Olympics. The (economic) slowdown (in the US and China) could have contributed to this," said an official of state-owned MMTC Ltd, who didn’t want to be named. Iron ore is India’s biggest export to China by value. India exported 92 million tonnes (mt) of iron ore valued at around $6 billion (Rs29,220 crore today) to China in 2007-08. This accounted for 88% of the country’s total export of the mineral. The MMTC official said Chinese steel makers have stopped placing orders for iron ore since August. “The price of medium-grade (iron ore) fines was around $140 per tonne three months ago and now the exporters have reduced it to $85 per tonne. There are almost no takers for iron ore in China," he said. He added that around 4mt of iron ore is piled up at various ports across India. A questionnaire sent to the Chinese embassy remained unanswered till Wednesday evening. India’s mining industry has grown significantly over the past five years, largely on the back of a construction boom in China. 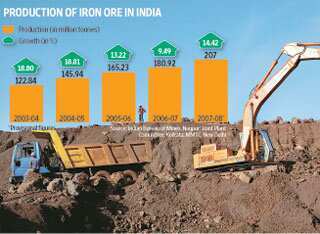 The growth rate in iron ore production in India ranged between 9.49% and 18% during the period. India’s national transporter, Indian Railways, had planned to acquire more wagons earlier this year to cater to the huge demand from iron ore suppliers for shipping ore from mines to ports to be shipped out. The decline in ore exports could be the beginning of a slowdown, said an industry representative. According to the secretary general of industry body Federation of Indian Mineral industries, R.K. Sharma, the crisis may be long term in nature. “The situation is unlikely to improve until the US economy picks up," he said. “Earlier, we used to get 30-40 inquiries at a time, now we hardly hear from a couple of buyers and even these are not converted to sale," Sharma added. He said that the decline in exports could also affect domestic supplies. “If there is no demand for iron ore fines which are exported, it would be difficult to sustain operations catering only to the domestic demand for the (iron ore) lumps," he said. Fines, or ore with a higher iron content, is largely exported, while lumps, or ore with a lower iron content, is used by domestic firms. The executive director of Karnataka-based mining company MSPL Ltd, Rahul Baldota, said the government needs to remove export duty on iron ore and force the railways to reduce freight charges immediately “in order to save the iron ore mining industry". According to Baldota, apart from the slowdown, multiple factors have caused the sudden dip in demand from China. “Steel prices have decreased worldwide, (and) China has a surplus stock of steel —all of which have caused this fall in demand. The slowdown may also have affected the financing capacities of Chinese steel makers." Meanwhile, the issue of falling iron ore demand was discussed last week at a meeting of a committee of secretaries on prices, a group of bureaucrats that reviews prices of key commodities. “It was brought forth that it was for the first time in recent years that the demand for iron ore in China has slumped," said an officer who was in the meeting, asking not to be named.